The Academy allows you to use scrolls of wisdom to improve smaller aspects of your game. To use the Academy you must first complete it. The building is located in the North section of your city and has a fixed position. Once built you can begin using your Scrolls of Wisdoms. The various improvements are arrayed in a development tree and earlier improvements must be unlocked to a certain level before gaining access to later ones. Do not expect major game changers as the improvements are designed to be subtle and necessitate investing many scrolls to see a marked improvement. There is a set of improvements, the only purpose of which is to unlock the next tier of improvements. Every Unit has a Speed Improvement. Units can be improved 40 levels at .4% each or 50 levels at .3% (for non-Scout Cavalry) each ending with ~15% boost to speed. Every Unit has a Production Time Reduction Improvment. Units can be improved 40 levels at .3% each or 50 levels at .2% (for non-Scout Cavalry) each ending with ~10% boost to speed. Tier 2 Contains an Improvement for Increasing Tower Repair Speed Time. 30 levels at 1.7% each. Tier 2 Contains an Improvement for decreasing the time it takes to sign new agreements. 20 levels at .6% each. Tier 2.2 Contains an Improvement for increasing the number of Heroes you can train. 40 levels at one additional Hero every 2 levels. Tier 3 Contains an additional Improvement for decreasing the time it takes to sign new agreements. It is identical to the first. Tier 3 Contains an Improvement for reducing the grain consumption of your troops. There are 80 levels at .1% each for a max of 8% reduction. This is often considered the most important improvement to research fully first. 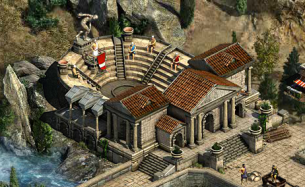 As it is the only one that allows you to field substantially more troops and thus increase your total power. Tier 3 Contains an Improvement for increasing the number of colonies you may control. You must research all 30 levels to hold 1 additional colony. Tier 3 Contains an Improvement for decreasing the cost of Veterancy. There are 50 levels at 1% each. This is a very useful improvement BUT only if your coalition controls upgraded Pantheons. Tier 3 Contains an Improvement for increasing combat experience. 40 levels at .5% each. Scrolls of Wisdom are your currency for making improvements in the Academy. The two primary ways of earning scrolls is by leveling up and by completing the Persian Position Quests. Leveling - You earn a certain number of scrolls based on the level. Persian Positions - The amount appears to be random. Global Quests - You may acquire scrolls via a global quest, but you must gather a significant amount of tokens to do so. GPs - You may spend Glory Points to buy Scrolls at 1 per every 100 GPs. You have the option to redistribute your scrolls if you choose. The first redistribution is free. After that, it will cost you Drachmas. Redistribution is not instantaneous. You will have to remove points from improvements down to the minimum needed to unlock any later improvements you have made. Removing points adds scrolls to your available scrolls. You may then spend those scrolls as normal investing one at a time and waiting the required study period. This page was last modified on 10 August 2017, at 13:08.